Purim in our household is a year long event. We plan for next Purim the minute that it ends and brainstorm together ideas to create the costumes we come up with. We order months in advance the supplies and think of creative solutions. 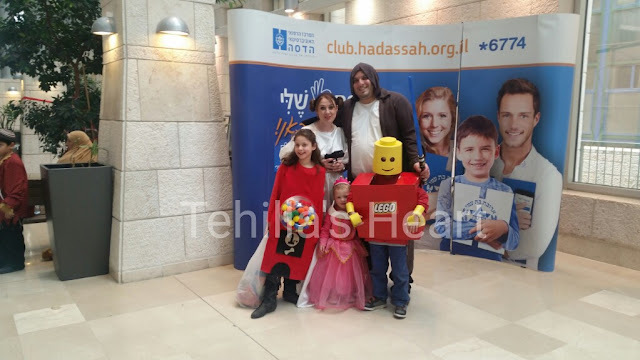 Tzviel: I love Purim. It's a holiday that is so much fun. But it is also a little sad. Me: Sad? Which part of it is sad? Tzviel: Well we get dressed up, have a party, give out candy and get candy...It's so much fun. Me: Yeah? So why is it sad? Tzviel: There are kids stuck in the hospital who can't do any of that. They can't get dressed up or have parties. It's so sad for them. Me: You're right. You are so right. We were one of those families for many holidays stuck in the hospital. It is sad. Tzviel: Can we do something for them? Can we make them happy. Me: Absolutely. I love that you thought of this and yes, we will definitely do that. I couldn't be more proud of Tzviel. And how could we not give back? You can't imagine the feeling of being stuck in a hospital over holidays, while the world carries on and celebrates. When people visit in the hospital it breaks up the monotony of hospital life. It brings smiles to very worn and sad faces. So we planned for today to give back. The kids were so excited and picked balloons, candy, and noisemakers to give out. We all got dressed in costumes and went from floor to floor bringing happiness to patients, families, and staff. It was a special experience and our kids gained so much out of it. They asked that we make this a new family custom and we will definitely be doing that. We are blessed to be in the position this year to be the givers and not the receivers. We are blessed to have kids with kind souls. More Purim posts will come tomorrow.